Bruce Chong shares his vision for the department. Our department is housed in the red brick building at 145 East Michigan Avenue, near the Lynn Business Center and McMahan Music Hall on the DeLand Campus. We are writers, artists, programmers, planners, budgeters, media experts, public relations leaders, strategists, and consultants. Our Creative Services department handles campaign conceptualization and implementation, graphic design, web design, all aspects of publications, brochures, marketing literature, e-marketing, and marketing-related photography and videography. Our Media and Communications department is responsible for media relations, internal and external communications, crisis and emergency communications, Stetson University Magazine, Stetson Today, social media, web editing and the president's newsletter, Significance. Our University Events department coordinates and implements all aspects of more than 100 large-scale university events each year, including Commencement, meetings of the Board of Trustees, and other events related to the Stetson University mission. Part of the Creative Services department, Web Services oversees the Stetson University website and social media presence, including content strategy, user experience and usability, and CMS training and assistance. Learn when and where public and school-related Stetson University events take place. We encourage the university community to post news of their events. Read news from the Stetson University community for the Stetson University community. Requires campus login. This web page features a compilation of media stories that relate to Stetson University. Read the electronic versions of SU (Alumni) magazine and VISUAL (Admission) magazine. 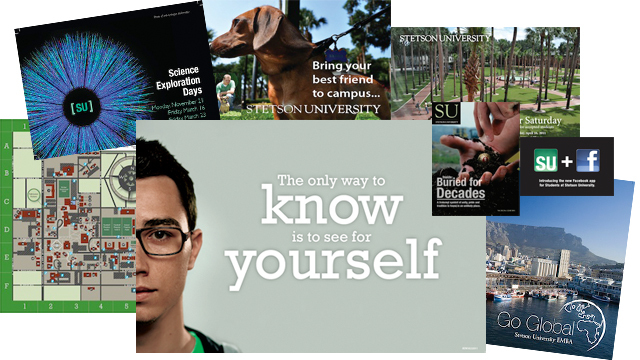 Our e-magazine is a one-stop destination for everything Stetson. Catch up on university news, events, photos, videos and more. The brand guide outlines the design and text elements needed to effectively communicate Stetson University to the world. The Editorial Style Guide is designed to be a quick reference tool to help communicators write consistently and appropriately in print and electronic materials written for and about Stetson University. News and Media Relations created the Experts Guide to give reporters and editors convenient access to Stetson University faculty and staff experts. Request a project, assistance or make an appointment. Find help or request a website, web form, site update, social media help or other web assistance.